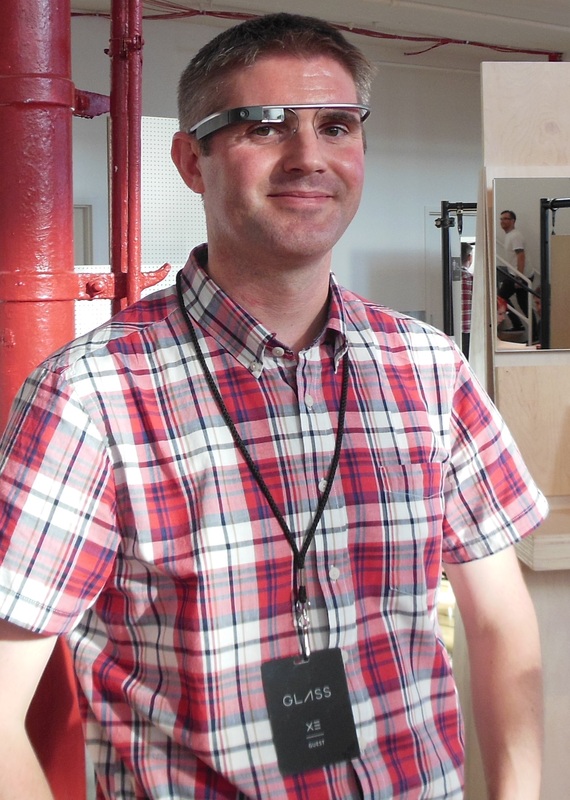 After a bus trip, two flights, and a taxi ride I finally arrived at the Google Glass suite in the Chelsea Market complex, New York. Google has renovated the eighth floor of this building to host the one-on-one Glass set-up sessions. The style of the suite is simple, uncluttered, and clean to mirror the Glass interface experience. The main Google office in New York is situated across the street from Chelsea Market. I arrived at 3:30pm straight from the airport for a 6:00pm appointment. As I waited for my guest to join me, I met a wide range of fellow Glass Explorers as they arrived for, or left from, their Glass appointment. While I cannot say anything from such a small sample size, there was an interesting mix of individuals obtaining Glass – professionals, students, and a couple of family groups all passed through the doors. Create a Google+ Circle Specifically for the Students in the Seminar: For this to work effectively, every student taking the seminar would also need to create the same circle of people in their Google+ account. Pros – any video, image, or post that is shared with this circle will be visible to everyone in the seminar. Cons – the material posted would not be available to non-circle members who might want to follow the Glass-augmented seminar. We discussed the idea of developing a Google+ community around the seminar, but one challenge with this approach is the potential volume of material that might be posted. Other options discussed were to develop a blog or Facebook page dedicated to the seminar. Both have merits and shortfalls, the main one being that they do not take advantage of the seamless integration of Glass with Google+. Downloading Videos/Images from Glass: While picture/video files automatically upload to your Google+ account, they can also be downloaded to your computer from Google+ or directly from the Glass device via the micro USB cable. Downloading these files to your computer might be useful if you would like to edit a video or image before posting it to a forum. The Glass device has about 12.6 GB of internal storage, which should be enough to store a manageable number of pictures and/or videos. The Battery Life of Glass: Many commentators have written about the poor battery life of Glass. Because of this concern I asked about whether a mobile power source/battery would be worth purchasing. The consistent response I received was that it is best to charge Glass using wall outlets. For extended video recording, the recommendation was to charge the device while recording the video. If you are able to do this, the weight of the micro USB cable may pull the Glass device down to one side, but you will be able to use the device indefinitely. I still think it may be worth purchasing a mobile power source/battery, but will wait to see if this is necessary based on how and where I use the device. 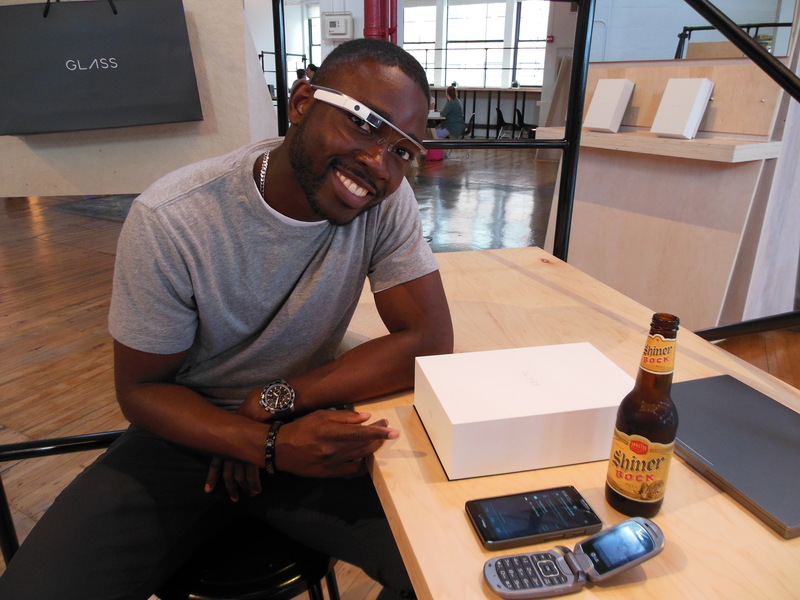 Personal Security: I asked several Google employees when and where they use Glass around NYC. The common response was that you should treat Glass as you would any other expensive mobile device – i.e., put it away if you are entering a situation in which it may draw unwanted attention. As soon as my guest arrived, we obtained our Glass passes and were met by Soji Ojugbele, who would spend the next two hours working with me to set-up my Glass device. These appointments normally take up to an hour, but my persistent questions extended our session until the Glass suite closed. This did not faze Soji, who patiently and comprehensively answered every question. Before attending this appointment, I was a little skeptical of the value of traveling across the country to set-up a wireless device. However, the attention to detail, patience, and professionalism of the Glass team (especially Soji) made the effort worthwhile. Upon leaving the Glass suite, I felt confident that I could use the device and that it was fully in sync with my smartphone and Google+ account. As an aside, I highly recommend taking a guest (who owns a smartphone) to your appointment so you can begin to test the various Glass functions such as making a call, sending a text, etc. while setting up the device. This also gives your guest an active role in the session. I selected the shale (grey) Glass device, but I could have changed my mind if another color caught my attention. Close contenders were the blue or black options. In my previous post, I was concerned about having to wear contact lenses. When I first put on Glass over my prescription glasses (see adjacent picture), I had trouble viewing all the edges of the welcome screen. Therefore, I decided to wear my contact lenses for the remainder of the session. The viewing experience with contacts was much better. I later tried wearing the Glass device over my prescription glasses (in the apartment where I was staying) and was able to view the edges of the Glass welcome screen. However, the image is not as crisp due to some refraction occurring at the edges of the screen. 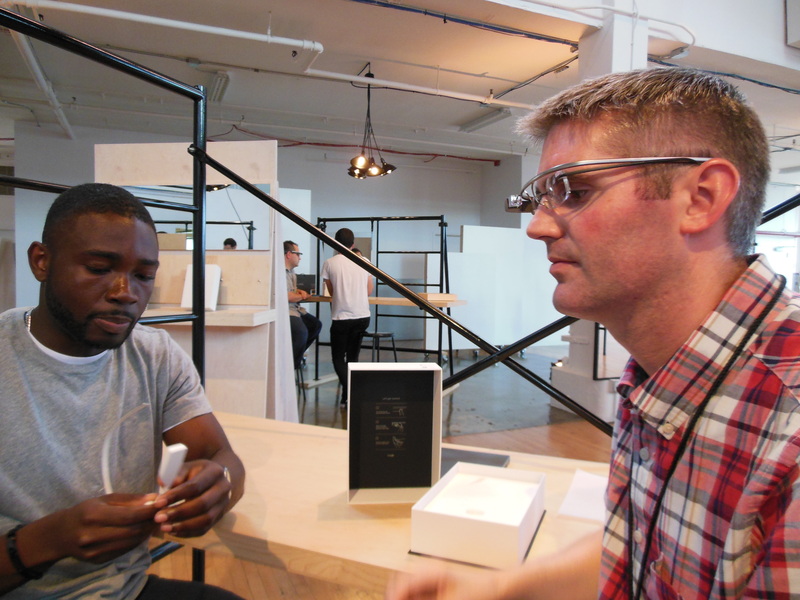 While testing one of the Glass functions during my appointment, I met a Google employee who was wearing a Glass device mounted on a specially-designed frame with prescription lenses. This prototype frame is not yet available and I wasn’t able to convince this person to provide me with a pair of these frames. Apparently, when the Glass prescription frames do become available, it will be possible to detach the Glass device from the existing frame and attach it to the prescription frame without too much trouble. This is good news for people like me who struggle with contact lenses and do not want to wear two frames at once. For now, I’ll either have to wear contact lenses that will reduce the overall quality of my vision or look a little strange wearing two frames at once with some compromise in the crispness of the Glass screen. After following Soji’s instructions on how to sync the Glass device with my phone, the wireless network, and my Google+ account, I was able to begin using its various functions. The device is impressive. The user interface is simple and intuitive and the device does not feel too heavy or uncomfortable to wear. It takes a little while to get used to looking at the Glass screen and how to navigate the operating system by swiping your figure along the side of the frame, but these are skills that I’m sure will become second nature over time. In the video below – my first Glass video – Soji is explaining how I can extend a video being recorded using Glass.